Raam Dev – Exploring the intersection of technology, humanity, and life purpose. What are kids really good at? Kids are really good at failing. Of course they're not trying to fail. That's not their intention. Their intention is to succeed. But they can't succeed. They can't succeed until they fail enough. And their brains know this, their brains feel it. So they fail anyway. They do their best even when their best won't be good enough, when it won't get them to where they're trying to go. Ananda drew me a picture the other day. It's a picture of 75 small circles (I counted them). There isn't a single perfect circle. In fact, many of the circles don't even have ends that meet. They're failures. Each one an attempt to draw in one smooth motion a complete circle, and each one a failure. But she drew them anyway, without hesitation. I watched her. Circle after circle after circle. Failing, but repeating each attempt without hesitation, without frustration. There is so much beauty in this lesson, so much wisdom. It feels hard to grasp the universality of it. Children fail regularly, so they learn and grow and get better, regularly. But as they grow older, they grow more afraid, more unsure, more critical of themselves. The hesitation sets in. They learn slower, and slower, and slower. Instead of growth being self-directed and self-motivated—instead of it being fun—it becomes occasionally motivated by the dread of an external event that might cause more discomfort than the potential failure. For Ananda it wasn't 'failure'. For her, it was play. It was having fun. It wasn't painful, it was enjoyable. 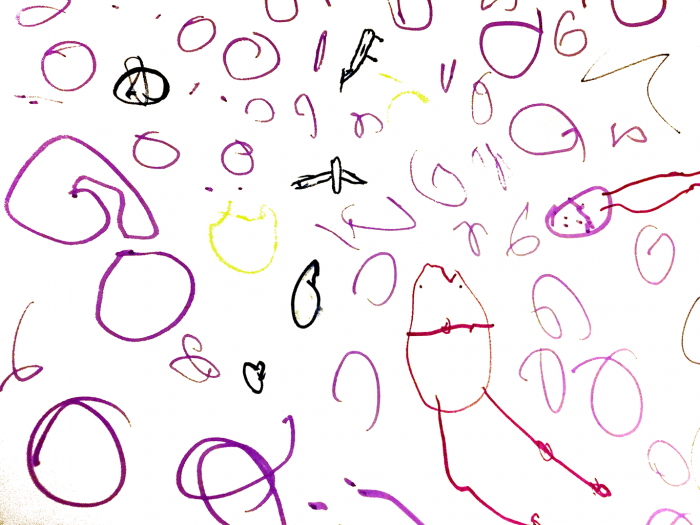 She didn't draw 75 failed circles, she drew 75 shapes that looked like circles so that she could give them to her daddy. Her goal wasn't perfection. Her goal was to try, to make an attempt, and to have fun doing it and then to be happy with the result. Her goal was simply to do something, to take the idea and add action to it, to start and then to finish. To start, and then finish. Kind of like drawing a circle. When thousands of people began reading what I was writing, I got scared. Each day I looked for more ways to reassure myself that everything I did would lead to a little more success, that each step would be safe. Eventually, I got so scared of failure, so scared of 'losing it all', that I stopped risking failure altogether. It took me a long time to figure this out, and it seems so obvious to me now, but you cannot have success without failure. Success is achieved by overcoming failure. You can't have one without the other. The more that you try to avoid the risk of failure, the more you avoid the potential for success. Here's something else I realized: a 'success story' is just that, a story. There's nothing special or magical or mysterious about success. It's a story. It's a recollection of a specific series of events that follows the hero's journey, a common template that stories have been following for thousands of years. It involves 1) facing a challenge, 2) choosing to accept the challenge despite the risk of failure, and 3) overcoming the challenge. A failure is just an incomplete success story. A failure is one of the steps on the way to success. It's a toddler falling down on her way to running, the scale not budging on the way to getting in shape, and the frustration of inadequate knowledge and experience on the way to achieving a dream. There are so many success stories and so few stories of failure because failure is a story that we don't want to hear (and because it's only part of a bigger story—it's an incomplete success story). Failure is a painful thing that reminds us that success requires work, that it requires effort. A story about failure reminds us that our work and our effort might not get us to where we're trying to go, that getting to where we're trying to go might require more work, and more effort. The narrative of your life's story is controlled by what you choose to focus on. Reframe your story by consistently focusing on the positive, not the negative. Focus on the potential for success, not the risk of failure. Tell yourself a different story. Is there a chance you'll fail anyway? Sure, but focus on the positive! What positive thing might come out of failing? Focus on that. If you choose to focus on the negative, all you'll see is negative. If you choose to focus on the risk of failure, all you'll see is failure. That's how stories work. Whatever part of the story you choose to focus on becomes your reality. It becomes your story. Remember, you don't need to have a perfect record. You only need to show up more times than you don't. So show up. Rewrite your story. Life is not a lottery, it's a landscape. You can drift around and see what happens before you die or you can choose to climb a few mountains. Thoughts invent it, speech conveys it, actions realize it. The most powerful story you will ever hear is the one you tell yourself every day. Do something epic once a year, something that feels epic to you. Plan it. Make time. Once a year. That's what, maybe 50-80 in your lifetime? Don't spend your time being fake or chasing fake things. You have a fixed number of hours left to live. Be real. Pursue meaningful things. Live outside genre, gender, and race. Live outside of those confines. Be refreshing. Create your own creative language. Create a genre of you. Sometimes the best thing to do is delete. You don't need to have a perfect record. You just need to show up more times than you don't. If you can't remember the last time you didn't show up, that's good enough. Nobody has a perfect record of walking--we all slip and fall down at some point. Yet nobody thinks about that (unless it's you and you just slipped), because something greater--getting back up--outshines the act of falling down. You don't need to have a perfect record. You just need to show up more times than you don't. And if you haven't shown up in awhile, that's okay too. Nobody has a perfect record of brushing their teeth--we all miss a day at some point. Yet nobody thinks about that (unless it's you and your teeth are scuzzy), because something greater--brushing your teeth regularly--outshines the act of missing it. Never be too busy to take a 20-minute walk and watch the sunrise. Doing nothing repetitively is doing nothing, repetitively.